The Shadow Springs wine dinner at Artisan Restaurant was one of the most fantastic wine dinners (and dinners in general!) I’ve ever attended. Artisan resides in Kernel Kustard’s former home in downtown Winston-Salem, and has been winning over diners for the past 18 months that they've been around. Executive Chef Kevin Reddick introduced himself and spoke about each course, giving a very personal touch to the evening. The aromatics and presentation of each dish really knocked my socks off, and wine pairings were spot-on. This event was quite a treat. The first course was good, but it was my least favorite (this just tells you how phenomenal the following 4 courses were!) Celeriac Bisque is creamy, earthy and topped with a spoonful of Truffles in Arbequina Oil. The Shadow Springs Seyval Blanc was a perfect match – slightly sweet to offset the subtle bitterness of the Celeriac. The two types of bread offered at the table (what I believe were a Salty Sourdough and Cheesy Sourdough - both divine) were tasty to dunk in the bisque, too. 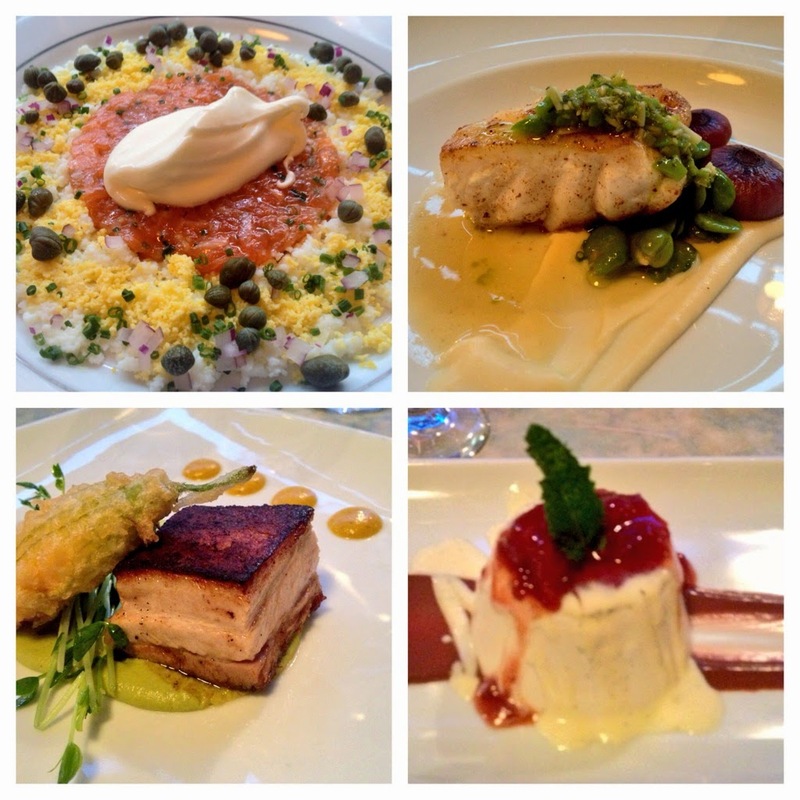 Clockwise from top right: Salmon Tartare, NC Grouper, Panna Cotta, Pork Belly. The next dish was absolutely fabulous. Salmon Tartare with Crème Fraiche, Hard Boiled Egg, Capers and Shallots is a brilliant interpretation of the classic dish. For a girl who typically doesn't enjoy salmon, this rendition wasn’t fishy, and it rolled on the tongue nicely, like good caviar. The pop of acid from the capers and the sharpness of the shallots brightened the dish, and the Crème Fraiche was a most luxurious touch. Shadow Springs’ Viognier was slightly dry and opened up beautifully with this plate. I was in love! I couldn’t believe my taste buds when I dug into Dish #3. A thick filet of NC Grouper rested on a smooth bed of Parsnip Puree, alongside Fava Beans and Cabernet Cipollini Onions, and to top things off, a dollop of Fava Bean Pesto. The flavors married beautifully, and were almost slightly reminiscent of (bear with me here, and I mean it in the BEST way possible) a pizza! Let me explain – the Parmesan and Herbs in the Pesto; the creaminess of the Parsnip Puree; the salty, meatiness of the Grouper; the acid from the Cipollinis – it was like a deconstructed pie. Words really can’t do it justice. The Barrel Fermented Chardonnay was lost on me; I was way too focused on the food to care about the wine here. As if things couldn’t possibly continue to be this outstanding…here came a gorgeous, thick-cut piece of Heritage Farms Pork Belly with Pea Puree, fresh Pea Shoots, a Tempura-Fried Goat Lady Dairy Goat Cheese-Stuffed Squash Blossom, with a tangy NC Sweet Potato Vinaigrette. This acidity brightened up the whole dish, and the Goat Cheese-Stuffed Squash Blossom is a perfect representation of seasonal produce. The Pork Belly though…this deserves its own blog post. Never have I had more tender, meaty Pork Belly. The fat melted into the meat perfectly – there was no “grissle” here – it was like butter. The Shadow Springs Crimson Sunset is a medium-bodied red, oakey – a nice complement. By some stroke of magic, I found room for the fifth and final course – a Vanilla Bean Panna Cotta, much like a cheesecake but more gelatinous, with Chocolate Ganache, Crème Anglaise, and Farmer’s Market Berry Jam. The velvety Panna Cotta had the perfect amount of jiggle, and the Berry Jam was a nice tang to the rich sweetness of the dish. I may have preferred a White Chocolate Ganache with this plate, because the Milk Chocolate was slightly too bitter. The French Kiss Chocolate Strawberry Wine was also a bit too dark as a match, but I really didn’t care. I was in a fantastic place. Chef Reddick loves working with people to create custom, special occasion menus - even family-style. The team seems very easy to work with and willing to accommodate their guests. I’m considering sending in a list of my favorite food words, and asking for a custom birthday dinner. I would literally die. I will be returning in the very near future. Now I know why so many of my colleagues can’t get enough of this place.